Stafford Battle is a Founding Geek as well as Web developer, Digital Designer, Presenter and Dad. He is the co-author of the AFROCyberspace: 1000+ African American Websites That Will Change Your World. The LA Times called Battle a "Cyber Activist" when he and his co-author Rey Harris traveled the country promoting their first book published by McGraw. Today, Battle and Harris are challenging laypeople to get involved with the future. The latest edition of the book: AFROCyberspace: 1000+ African American Websites That Will Change Your World by Stafford Battle and Rey Harris will be available at the Black Author Showcase on October 19, 2007 at Howard University Continuing Education in Silver Spring, MD. Battle and Harris have added more than 200 new links to the book as well as included new editorial about the Black presence on the Internet and how to take advantage of the tech that is changing the we prosper in today's world. 2.0 is taking a big step on the Web. Already, you can find Web 2.0 as well as Media 2.0, Medicine 2.0, Publishing 2.0 and many others. In case you are wondering what the 2.0 means, take a peek at Wikipedia: " . . . refers to a perceived second generation of web-based communities and hosted services — such as social-networking sites, wikis and folksonomies — which facilitate collaboration and sharing between users." Missed the show? Watch videos of the Live Earth Concert on MSN. See them now! Welcome to a series of articles about some of my favorite Open Source software. If you are not familiar with Ubuntu the challenge to Microsoft Vista, you should be. I will be autographing my new book on May 22 at the Psalms 117 Coffeehouse in Silver Spring, MD, from 5-8 pm. All are welcome. 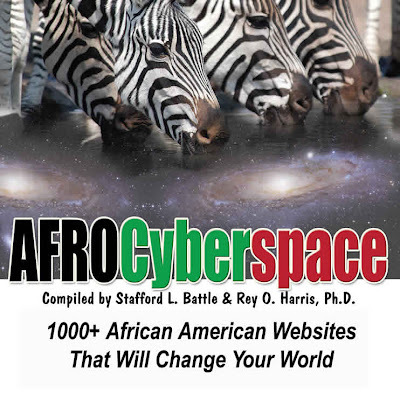 The title of the book is: AFROCyberspace--1000+ African American Websites That Will Change Your World. Rey and I coauthored this work and have spent many years refining it. Websites have a habit have changing and disappearing but we managed to capture what we believe to be are some of the best. Many of these sites may never turn up in the top 10 Google sites and in fact are difficult to find when you have to sift through all the garbage. But it was a task worth doing. Everyday I am amazed at what the Web can do and constantly stumble across some real gems. Hi, this is where I will be techno blogging.